Eating healthfully is an oft-neglected task on many busy consumers’ daily to-do lists, and the season’s shorter days likely won’t help matters much. For those with celiac disease or gluten sensitivity—who need to work that much harder just to find foods that won’t make them ill—incorporating healthful gluten-free foods into their diet can seem like one more hassle when searching the grocery store shelves. Shelley Case, RD, author of the Gluten-Free Diet: A Comprehensive Resource Guide, understands this struggle, as she believes the gluten-free diet is one of the most complicated eating plans to follow because of its many challenges. “First of all,” she says, “wheat-based products are major staples in the North American diet. Gluten-containing ingredients are frequently used in a wide variety of food and beverages, such as sauces, soups, seasonings, salad dressings, prepared meats, snack foods, chocolates, and beer. Add to that the average American’s frenetic pace, which affords little time for cooking, and concerns about cross-contamination when dining out. “When you put all of those together and then you say ‘you have to eat nutritious,’ it’s one more headache. With everyone trying to figure out whether an item is actually gluten free or not, the importance of nutrition is often forgotten,” adds Case. Carol Fenster, PhD, a gluten-free cooking expert, consultant to Bob’s Red Mill Natural Foods, and author of nine gluten-free cookbooks, including the new 100 Best Gluten-Free Recipes, finds time to be the biggest challenge for those eating gluten free. “We encourage GF-ers to eat whole grains, yet many of these grains take time to cook and everyone wants food prepared for them rather than investing in doing it themselves,” she says. While home cooking meals is an easy way for people to add some wholesomeness to their diet, cooking may not be an easy option—if an option at all—for some gluten-free consumers in the hustle of their every day. When this is the case—and for so many clients, this is reality—convenience, or ready-to-eat, foods can play a pivotal role in a gluten-free diet. Yet as with mainstream processed foods, ready to eat can easily add up to high fat and high sugar, and gluten-free foods are no different. Plus, research shows that adherence to a gluten-free diet could lead to nutritional deficiencies. Fenster says that for a long time, GF-ers have been satisfied with foods simply being labeled gluten free and considered safe to eat because it’s taken so long to get that labeling in place. “Now, we have to also question whether it’s good for us nutritionally,” she says. After surveying several dietitians about their favorite gluten-free finds, we’ve come up with the following sampling of products and ideas for getting the most nutrition from gluten-free convenience items. Eating a healthful morning meal can be challenging for consumers not dealing with the added stressors of gluten-free living, so convenience can be key to getting GF-ers off to a good start. As one tip, Case suggests that clients consider adding gluten-free oats— if they can tolerate them—to their diet rather than grabbing a basic gluten-free cereal. “That would really add a lot of good soluble fiber and B vitamins as well as protein, iron, and other nutrients,” she says. Lara Field, MS, RD, CSP, LDN, a pediatric dietitian and celiac disease specialist at the University of Chicago Celiac Disease Center, agrees that gluten-free oats are a nutritious breakfast option, but “make sure your oats are pure and uncontaminated,” she says. Field notes Cream Hill Estates, Glutenfreeda, Avena Foods’ Only Oats, and Gluten Free Oats as choices that do not have any cross-contamination with wheat. As another nutritious cereal option, Case recommends Nature’s Path Sunrise multigrain cereal, made of cornmeal, buckwheat, flax, and amaranth. And when it comes to hot cereals, which consumers will likely flock to more as the months get cooler, “what I usually suggest to people is using something like Bob’s Red Mill Mighty Tasty Gluten-Free Hot Cereal,” which has whole grain brown rice, corn, sorghum, and buckwheat. “And then I recommend to sprinkle in some ground flax for added omega-3s, fiber, protein, and just a lot more punch to their cereal,” she says. Sharon Richter, MS, RD, CDN, thinks an English muffin with a nut butter such as Justin’s nut butter squeeze packs makes for a convenient breakfast because it travels well, noting that she steers her clients to Food for Life Baking Co.and Kinnikinnick Foods when they’re looking for English muffins or other frozen bread products. One bread producer that offers more healthful items with a taste similar to gluten-containing breads is French Meadow Bakery, which has a multigrain bread that incorporates amaranth, quinoa, millet, sorghum, and teff. “These breads look, taste, and toast up like regular wheat-based breads,” she says. Case also notes Udi’s bread products as a line that clients have raved about. And while Udi’s breads may not have quite the number of whole grains as French Meadow’s breads, their taste and texture resonate with GF-ers who long for the gluten-containing bread they used to eat. Udi’s line includes other baked products in addition to breads, such as gluten-free muffins, cinnamon rolls, and bagels, and are also free of dairy, soy, and nuts. Several RDs believe Amy’s gluten-free frozen entrées to be popular choices tastewise—and they’re also good choices nutritionally speaking. Amy’s gluten-free line includes a vegetable pizza, macaroni and cheese, and bean burritos, which can also double as a breakfast dish. “Watch the fat and ingredients; however, most are more healthful choices than their frozen gluten-containing counterparts,” says Field. Organic Bistro is another option for those looking for a gluten-free frozen meal to take to work or pop in the oven after a hectic day. These single-serving meals use lean protein, fiber-rich whole grains, organically grown vegetables, and healthful fats. Some of the gluten-free varieties include Ginger Chicken and Alaskan Salmon Cake. “I love these gluten-free and organic frozen meals, as they provide organic whole foods in a nutrient-balanced eating occasion for optimal energy,” Koff says. And lastly, all the RDs interviewed love frozen Kettle Cuisine soups for a quick meal. All varieties, including tomato soup with vegetables and Angus beef steak chili, come in single-serving microwavable bowls. The company also offers organic, vegetarian, and dairy-free options to satisfy consumers’ varied needs and preferences. Everyone can surely remember a time when they were traveling, at a child’s soccer game, or in a last-minute office meeting and in desperate need of a nutritious snack to tide them over until that next meal. For such occasions, gluten-free snack bars were noted as a great portable resource for those on the go. Some favorites of our interviewed dietitians were Larabars and KIND bars because of their dried fruit and nut makeup. “Those are a few snack bars that at least have the nuts and seeds in them that make them more nutritious,” says Case. RD favorite KIND whole nut and fruit bars come in 21 flavors, with six new flavors recently launched. Newbie flavors include Blueberry Pecan + Fiber and Apple Cinnamon & Pecan, and all are free of hydrogenated oils and genetically modified organisms (GMOs). Each bar contains 170 to 190 kcal with roughly 4 g of fiber and 3 to 7 g of protein. For clients with a midafternoon craving for crunch, some dietitians say gluten-free chips can do the trick. Those cited most often by interviewed RDs include Kettle Brand potato chips and Food Should Taste Good tortilla chips. Kettle Brand potato chips, which come in regular and baked varieties, have no trans fats or preservatives and only non-GMO ingredients. Food Should Taste Good’s multigrain tortilla chips, an RD favorite also made without trans fats or GMO ingredients, are low in sodium and provide a good amount of fiber from quinoa. Both chips come in convenient single-serving sizes. A good gluten-free salsa, such as one of Mrs. Renfro’s gluten-free gourmet or regular varieties, makes for a low-fat yet still filling snack combo. And for those with a sweet tooth, Lucy’s cookies are adored among dietitians as a gluten-free treat. The cookies, which come in Chocolate Chip, Sugar Cookie, Cinnamon Thin, and Oatmeal Cookie flavors and are said to have a comparable taste and texture to cookies containing gluten, are baked without milk, butter, eggs, casein, peanuts, or tree nuts, so they work well for those with varying food sensitivities. For an even sweeter tooth, Fenster is a fan of mini chocolate fudgesicles from So Delicious. “Each is only 70 kcal and made from coconut milk rather than cow’s milk, so [it’s] a good idea for the dairy-sensitive folks,” she says. Gluten-free children’s foods are a bit more scarce, especially if you’re looking for products with a healthful punch. Organic Valley string cheese with a gluten-free cracker such as Mary’s Gone Crackers is one of Koff’s favorite gluten-free and kid-friendly options, as well as Kaia Foods’ organic and gluten-free granolas, kale chips, and fruit leathers. “These provide great on-the-go options for adults and kids and can also be the base or toppings for several at-home eating occasions,” she says. Mary’s Gone Crackers, which come in crackers, cookies, and Sticks & Twigs, are all organic and kosher and are made from whole grain brown rice, quinoa, flaxseeds, and sesame seeds. For a kid-friendly and gluten-free lunchtime suggestion, Case recommends Allergaroo pasta dinners, which are microwavable and come in Chili Mac, Spyglass Noodles, and Spaghetti varieties. “They’re also free of the eight most common food allergens,” says Case, who also likes Kinnikinnick products. Kinnikinnick offers animal-shaped cookies and graham-style crackers and pizza crusts that can be made in a jiff in the toaster oven with cheese, tomato sauce, and children’s favorite toppings. Case notes that some Kinnikinnick products should be treated as once-in-a-while sweets, but the same could be said for any kind of sweet. “And Pastariso, which comes in rice pasta and cheese dinners with different animal creature shapes, and Pastato’s fortified pastas are other meal options to look for when trying to please the younger gluten-free set. [Pastato] adds some quinoa flour and ground flax and some B vitamins, and they come in elbow, penne, and spaghetti,” says Case. Case says Larabar’s Peanut Butter & Jelly and Peanut Butter Cookie are flavors that may resonate with kids while still offering nutritious properties. For more of a sweet treat for college kids going gluten free—because what student doesn’t need a pick-me-up snack when cramming for finals—Brown notes that “Pamela’s has just created single-serve, microwavable instant brownie mixes,” which is an instant version of its Chocolate Brownie Mix. Each pack makes one brownie in roughly one minute. The holidays are fast approaching, and for those with a gluten-free friend or two who are at a loss for finding a gift that is sure to please (especially considering the standby cookie basket is null and void for this special breed of friend), enter gluten-free gift baskets, which are slowly popping up to cater to the gluten-free masses. I Can Have That! Gift Baskets, LLC is one such Web-based retailer (www.icanhavethat.com) of allergy-friendly gift baskets. Co-owners Jane Erickson and Diane Goodman launched the website one year ago, and it’s been gaining traction ever since. Diagnosed with celiac disease in 2007, Erickson came up with the idea to start a gluten-free gift basket company after “my sister commented that she had been unable to find a suitable gift basket for me and my son, who also has the disease,” she says. I Can Have That! was formed soon after. “There are many gift basket options available to the general public, but for people with concerns about food allergies and sensitivities, the options are limited,” notes Erickson. She says the company offers baskets with various themes, noting Italian, grilling, kids, and celebratory themes, to name a few. Erickson notes that more theme-related baskets will debut during the holiday season, including one filled with all things chocolate. Product offerings in I Can Have That! baskets include many of RDs’ faves: Lucy’s cookies, Food Should Taste Good chips, and Pamela’s baking mixes. While gift baskets work great as holiday presents, they can also work well for other occasions, such as birthdays, graduations, promotions, anniversaries, or as tokens of sympathy. So for clients or friends seeking a practical gift for a gluten-free foodie, a gift basket from one of the handful of companies dedicated to such might be just the solution. • Mary’s Gone Crackers is on Ashley Koff’s, RD, gluten-free hot list. “Organic and gluten-free crackers, Sticks & Twigs, and cookies made from whole grain blends, these all deliver a crunch, fiber, vegetarian protein, nutrient balance, and omega-3 fatty acids—great alone or in place of croutons on a salad or crumbled as the crust of a savory or sweet dish,” she says. 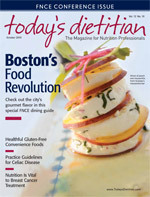 • Lara Field, MS, RD, CSP, LDN, says Voskos Greek Yogurt is one of her top gluten-free recommendations. “Not all yogurts are gluten-free,” she says, and “this one is not only gluten free but also is full of protein to keep you feeling full.” Field also loves Food Should Taste Good multigrain chips and Pamela’s Baking & Pancake Mix. • Marlisa Brown, MS, RD, CDE, CDN, thinks Udi’s bread and muffins make delicious gluten-free options and she also likes the host of possibilities that Tinkyada brown rice pasta brings to the dinner table. • Sharon Richter, MS, RD, CDN, like many other RDs, is in love with the taste of Lucy’s Sugar cookies and also recommends Naked Nuggets grilled chicken bites as a healthful lunch option for gluten-free kids who crave the fast-food fare that other kids are eating. • Fruit and nut Larabars are a favorite of Tricia Thompson, MS, RD. In addition to being gluten free, most of the nearly 20 flavors of Larabars are also free of dairy and soy and are vegan and kosher. Thompson also enjoys Van’s Natural Foods frozen gluten-free waffles with some fresh fruit and nuts for a well-balanced breakfast. • For those with a few extra minutes to spare, Sharon Zarabi, RD, CDN, CPT, likes to recommend that clients eating gluten free try a Glutino English muffin pizza for dinner. “Toast a muffin with marinara sauce and shredded cheese and top with green peppers, mushrooms, onions, zucchini, and tomatoes,” she says.